My girls are both big fans of anything butterfly, and understandably so – what’s not to like about these colourful, delicate insects? 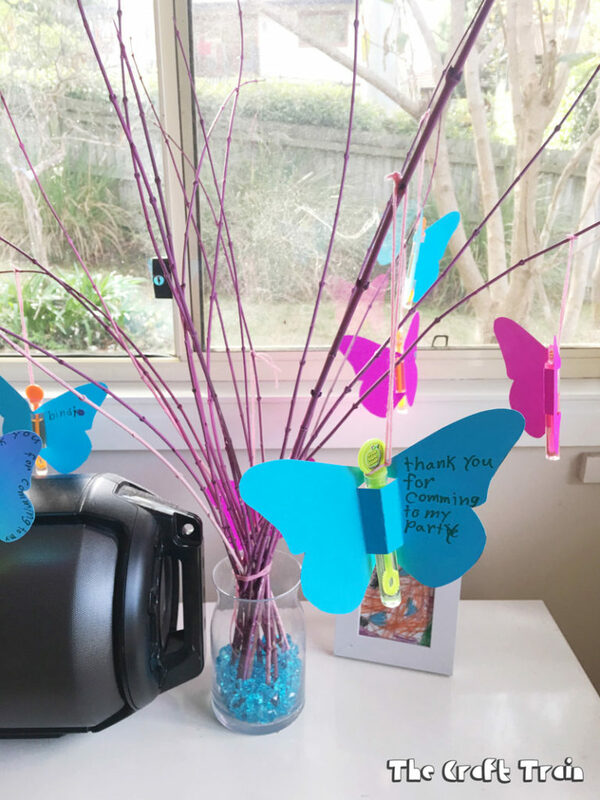 At the moment here in Australia it’s mid-winter and there are not a lot of real butterflies around but that didn’t mean we couldn’t throw a butterfly birthday party! 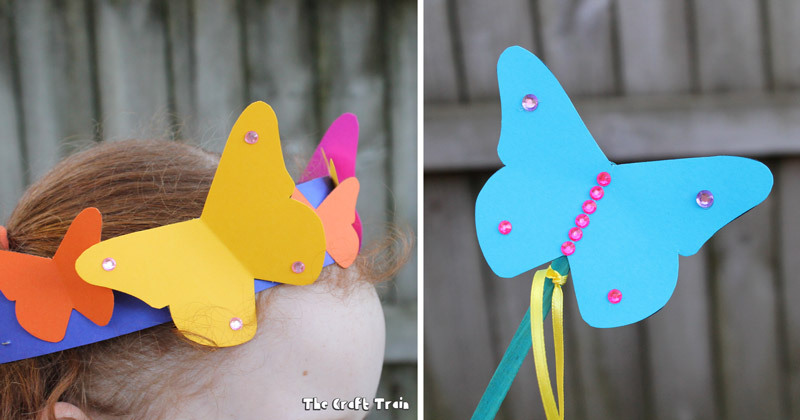 Last week we shared how miss R and I made a DIY butterfly pinata from an old cardboard carton for her party, and today we’re showing you how to make a colourful tiara and matching wand from construction paper. This was the craft activity that Miss R requested for her party. 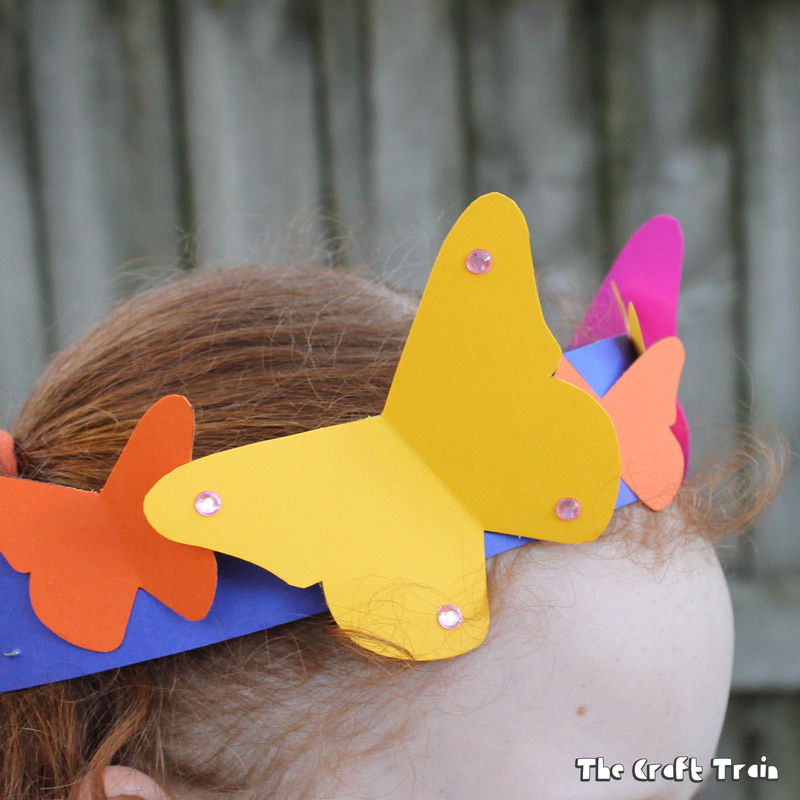 At first I was a little stumped as to how to create a ‘butterfly tiara’ craft and asked if she wouldn’t want to change it to a butterfly-shaped mask instead, but Miss R is always pretty certain once she’s made her mind up and definitely wanted the tiara. 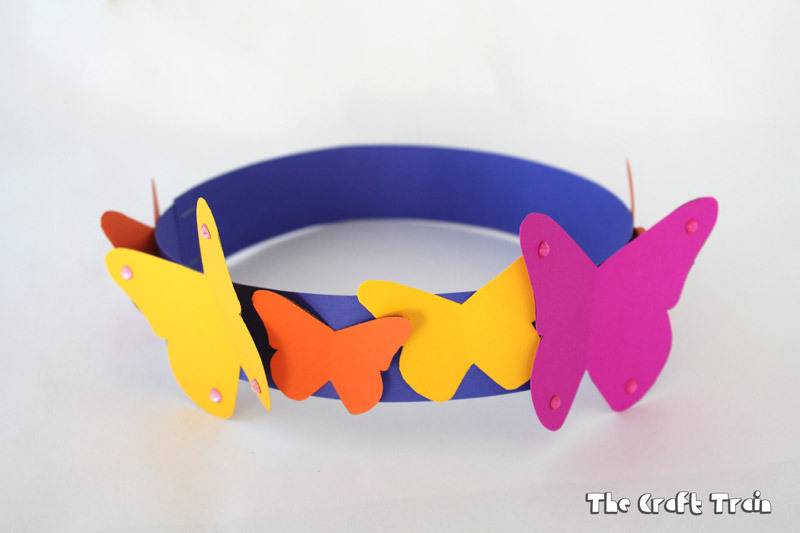 After a little experimenting I came up with the idea of a simple paper crown that could be stapled to the correct length to fit each child’s head and decorated by the children with paper butterflies of all different colours. This idea turned out well and we had many creations which were bright, unique and creative. 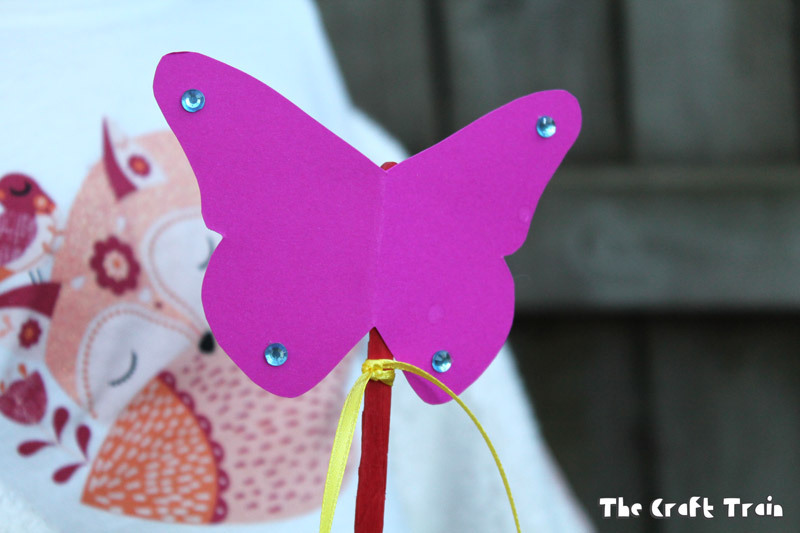 We used the same paper butterfly template to make matching magic wands. 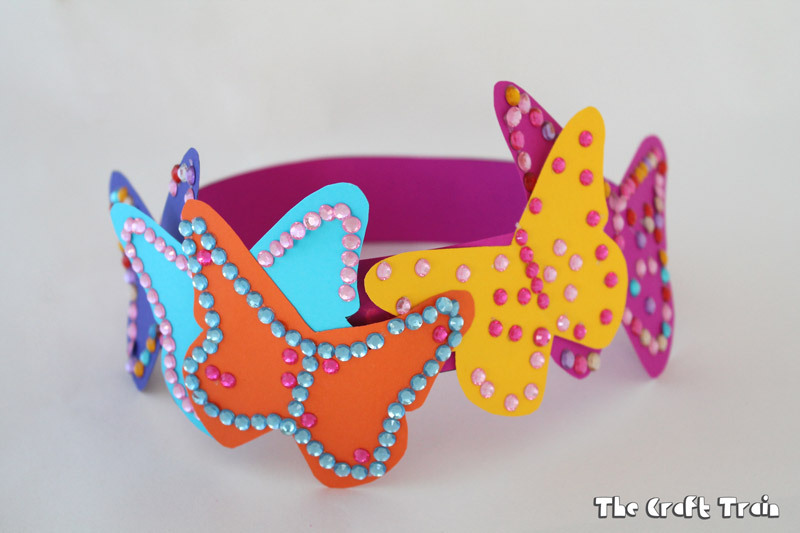 You could make this craft for a group of children at a party like we did or just as a fun weekend craft any time, however the template I’ve set up has been designed with making multiple tiaras in mind. • A4 sized construction paper in a range of colours that can go through your printer – we’ve used a heavy stock at 160gsm. The number of pages you need to use will depend on the number of tiaras and wands you wish to make, as well as how many butterflies get stuck to each tiara. I overestimated and printed out way too many but as a rough guide you’ll need at least 1 sheet of butterflies per child. The butterflies you can see in the image below are just our leftover ones, there would have been more than that. • Print out your template. I printed out a sheet of butterflies on multiple different colours so that the kids had more options for decorating. 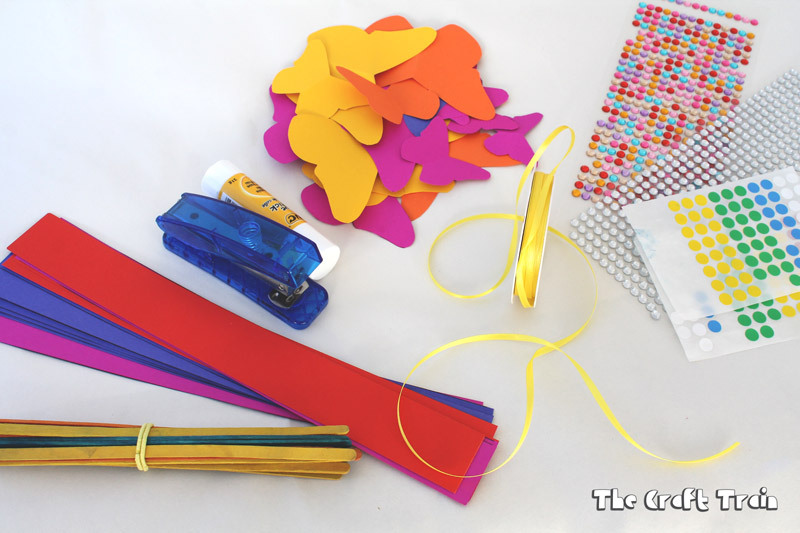 • Cut the butterfly shapes out, you might want to leave this for the kids to do but for ease of use I cut them all out myself the night before the party. • Cut the strips out, you will need two per crown. 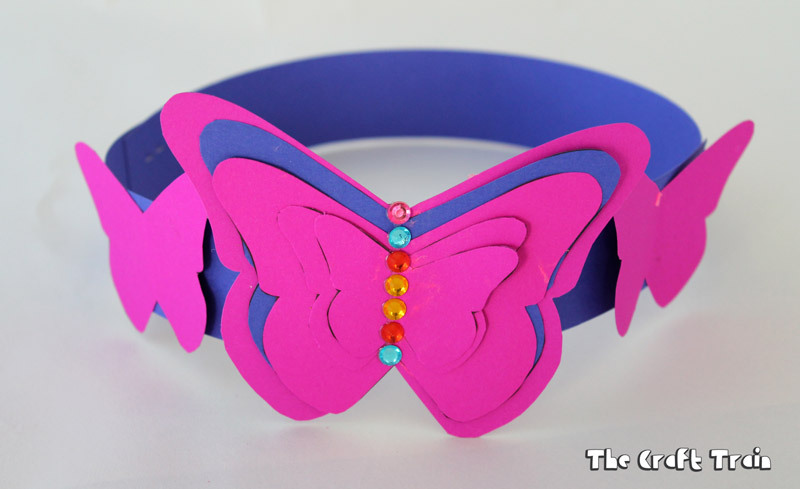 • Staple two strips together at one end and measure to fit exactly around a child’s head before stapling the other end. 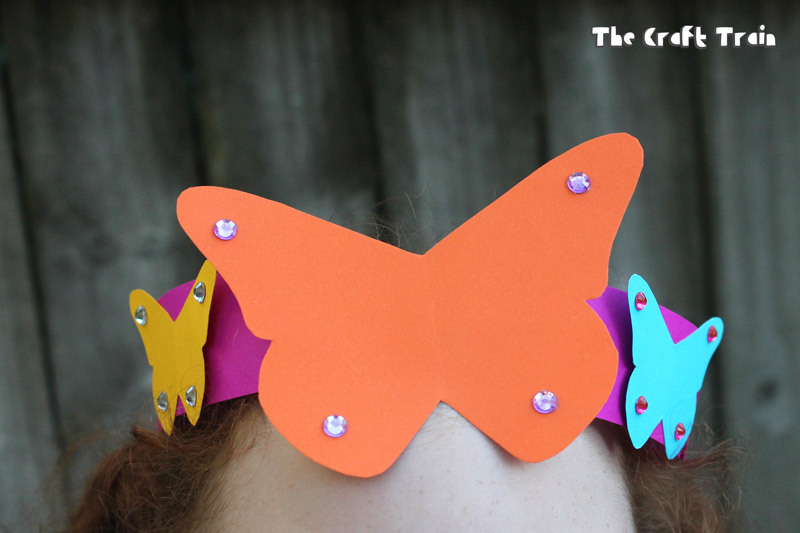 • Fold each butterfly shape in half, decorate if desired and glue to the crown with your glue stick in any design you wish. 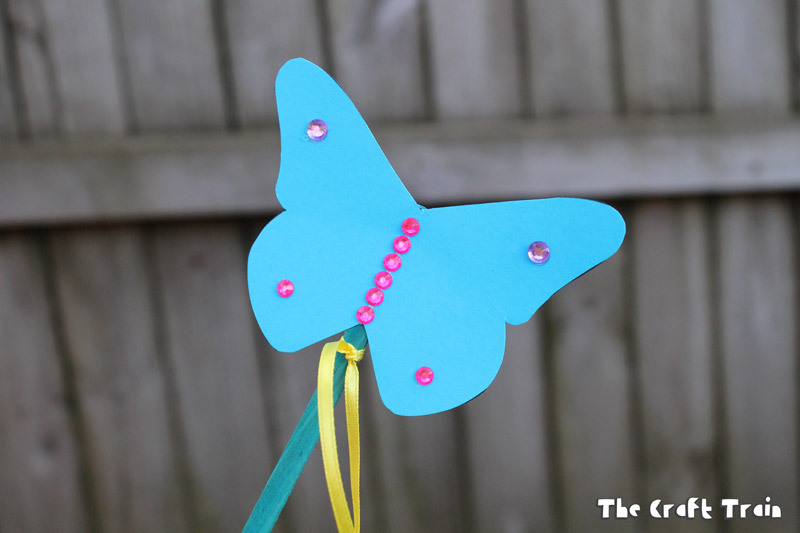 • Stick a butterfly shape to a craft stick for a wand, and decorate with ribbon and stickers. Ta-da! That’s all there is to it. Here are some of the designs made by myself and my own kids (the party-goers all took theirs home with them). We also used the large butterfly shape within the template to create thank you cards and placed a bubble blower in the centre for the body. For the pink stick tree (another specific request by the birthday girl) we used a can of hairspray left over from our crazy hair day efforts to paint a bunch of sticks pink. As you can see it sort-of worked but could have done with an extra coat of pink, however we’d run out. Miss R individually wrote on each card to thank the guests for coming and we sent them home with the party bags. The same large butterfly template was used to create the hand made invitations we shared on instagram. 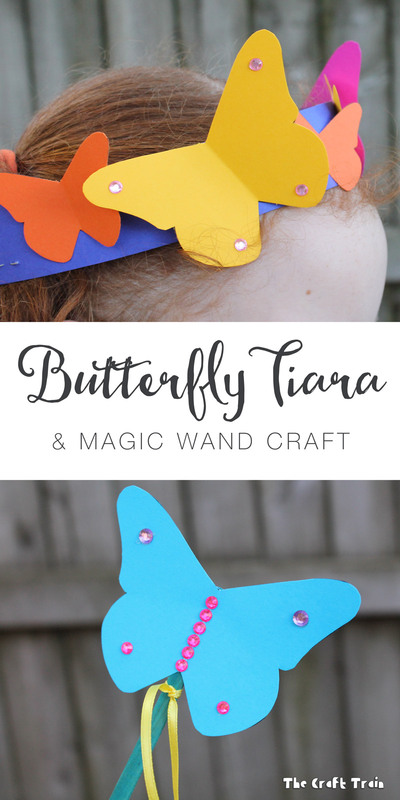 Some kids didn’t want a tiara only a wand or vice versa, and at eight years old I know it’s only a short matter of time before my eldest baby is too old for this kind of craft so I really enjoyed seeing them create their colourful tiaras and wands at the party. Childhood goes by way too quickly don’t you think? We also have literally hundreds of cool kids party ideas on our parties boards on Pinterest too.